The subject identified for today was “Piracy Accusation by Penzance Man”, the year was 1783. Unfortunately my record keeping has let me down and I cannot find the source for the story so here's a maritime mystery for you instead. Obviously this event did not today but the script which generates these pages requires a date so 2018 it is. On some unknown date, probably between about 1780 and 1840, a ship sank in Crow Sound just off St Mary's in the Scillies. There is, in fact no sign of the ship at all, what's there is a cargo mound: neatly stacked steam engine parts and metal pipes. Sitting on the top of the mound is a large metal wheel, and there are several other smaller wheels in the mound. Not surprisingly the wreck is known as the Wheel Wreck and it's now the subject of a virtual dive experience which you can find on the Historic England Virtual Dive Trails website. The Wheel Wreck was discovered in 2005 by divers Todd Stevens and Phillip Roberts and initially dated at 1850 or later but further research has indicated that it could be older. The Wheel Wreck is now the subject of ongoing historical research which still consists of more questions than answers. Almost nothing is currently known about the vessel that carried this cargo, she has completely disappeared and so far no real candidates have turned up in sources such as Lloyds or the various wreck lists available. The likelihood is that she was a small schooner or brig of something like 90 to 100 tons, the sort of vessel which operated as part of the Welsh fleet bringing coal to Cornwall and taking back cargoes of copper ore. The wreck cargo has been estimated at about 30 tonnes weight and requiring a hold of about 9.6 metres by 5.4 metres, about right for one of these coasting vessels. The cargo includes the key components of a mine shaft pumping column - H pieces; windbores, sections of rising main. It also includes a a badly damaged cylinder of 43” diameter, suggesting a pumping engine rather than a rotative engine which would normally have a smaller cylinder. The large wheel was initially thought to be a flywheel but the recent discovery of gearing teeth on the rim suggests that it may be part of a rotative drive mechanism so maybe this engine was a dual purpose machine used for both pumping and winding. The smaller of the two large wheels in the mound was also found to have teeth. The large wheel has 126 teeth and the small one 42, a ratio of 3 to 1 and exactly the same ratio as the drive mechanism on the 22” whim built at Levant Mine in 1839. The cargo also includes lots of socketed lengths of white cast iron piping, These are presumably water pipes but the precise purpose is currently uncertain. The cargo is also interesting because of what it does not include - there is no beam, sweep rod or crank. The sweep rod and crank would be required to transform the up and down motion of the beam into a rotative motion for driving a whim or stamps battery, as suggested by the presence of the geared wheels. There is no boiler, no steam pipe, no condenser, no valve gear, in fact apart from the cylinder the engine itself is missing. There are also too many H pieces for the number of rising main sections, suggesting that maybe the missing sections are part of another cargo along with the other missing items. Nothing has so far emerged as to the origin of the cargo though a foundry and engine works would seem a reasonable bet, unless of course it was a second hand engine being redeployed by sea. It's tempting to think the presence of the wreck in the waters of the Scillies indicates a Cornish origin for the cargo but this needn't be the case. While the Harvey's or Copperhouse foundries at Hayle could be the origin the cargo could equally well have originated in Coalbrookedale, at Neath Abbey or at the Boulton & Watt Soho works in Birmingham. The one thing we can say with regard to origin is that if it was Cornish it would have to be later than 1779 when the first foundry and engine works in Cornwall was established by John Harvey at Hayle. Equally puzzling is where this cargo was bound for, we can't tell whether it was going overseas or just being shipped from around the coast, perhaps from Hayle to Penzance or somewhere else along the south coast. Another mystery relates to the large wheel. It's been pointed out that the casting of such a large piece of work would be technically very challenging and rather unnecessary since it was usual to cast these things as a number of separate parts. More work needs to be done to determine whether the wheel is in fact an assembly of separately cast parts but if it was it doesn't make a lot of sense to ship it assembled as it would be much more difficult to manoeuvre and much more prone to being damaged. Recently the picture has become a little clearer. The analysis of glassware found at the site suggests an earliest date of about 1790. Other contextual material may throw more light on the date but it looks as if it will be some time before the true identity of the Wheel Wreck emerges from the murky waters of Crow Sound. 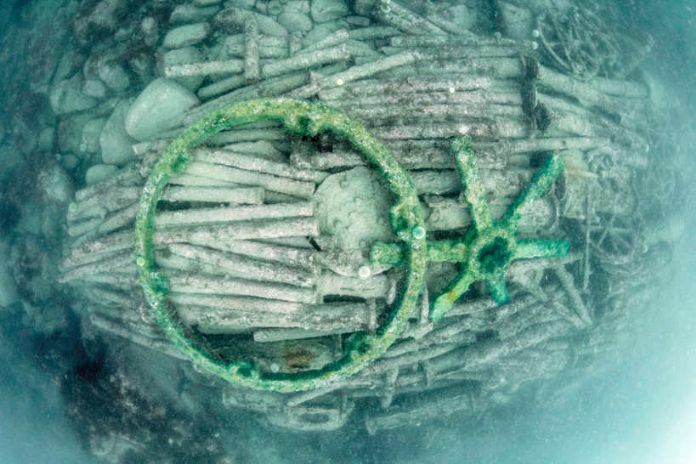 The Wheel Wreck is being researched and investigated by the Cornwall and Isles of Scilly Maritime Archaeology Society (CISMAS) who have created the virtual dive for Historic England.